Approach will automatically catch the emails of customers who have entered their email addresses and have consented to getting emails. Approach will automatically catch the emails of all customers who have entered their email addresses on your store and have consented to being sent marketing emails and newsletters. We are also compatible with external email popup apps such as Privy, PixelPop, Wheelio and Shopify Email Popup. Any email information added on these compatible apps or on the store will automatically be caught by Approach. Approach will add the information of these customers to the recipient list called 'Online Store Customers', however you can change the settings for the recipient list you want to sync online store customers with in your LimeSpot Admin Panel under Settings > Account. 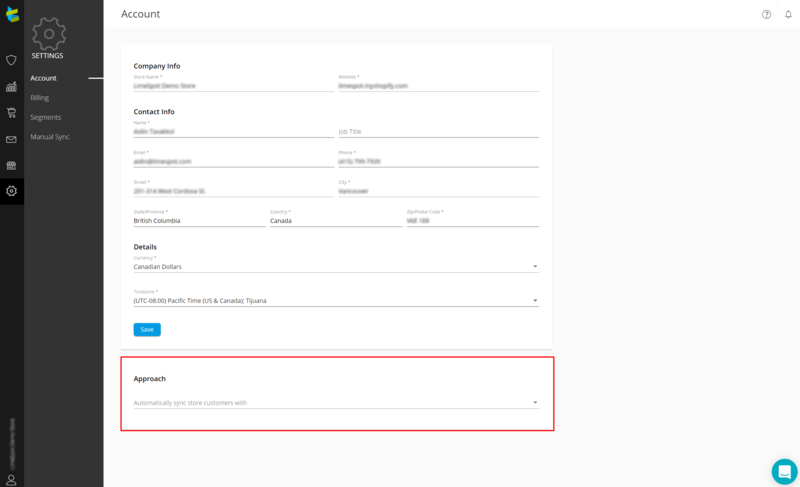 At the bottom of the screen you will see a drop-down list under "Automatically sync store customers with" and you can change the recipient list as per your liking.